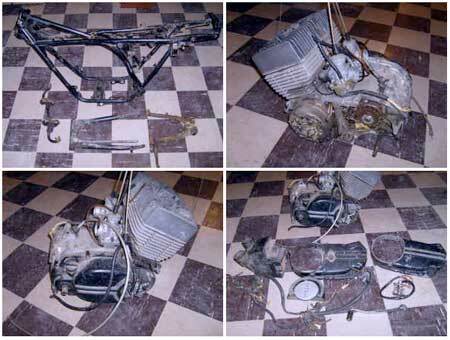 The parts for sale are from a '72 Yamaha r5 350cc 2 stroke street bike. These were the precursor to the rd's. The main difference is that the r5's are 5 speed where the rd's are 6 speed and the r5's use piston port motors while the rd's use reed motors. For sale is the frame, swingarm, center stand, footpegs and mounts as a package. I purchased this frame off of the previous owner with a lost title. He can furnish a bill of sale to myself. And I can furnish a bill of sale for the new buyer. Since this frame is older than '82 a paper trail is not needed when applying for a new title, but the bill of sale is always good to have. The vin stamping on the stem is clear and has never been tampered with. The frame is in excellent shape. Practically rust free. I am accepting all offers on the frame. Give me your best offer. Once again, I am accepting offers on the engine. Give me your best offer and we can make a deal. See the Craigslist listing for more details.